Ellison (concussion) has been ruled out for Sunday's game against the Cowboys. Ellison (concussion) remains in the league-mandated protocol Thursday, Art Stapleton of The Bergen Record reports. Analysis: Ellison continues to nurse a head injury sustained during Sunday's loss to the Colts. The veteran did not practice Wednesday and is working with trainers on the side during Thursday's session. If Ellison were to sit out Week 17, Scott Simonson and Garrett Dickerson could receive increased roles behind Evan Engram. Ellison is ruled out to return to Sunday's game against the Colts due to a concussion. Analysis: Ellison exited Sunday's contest during the first quarter, and will need to clear the league-mandated concussion protocol before eventually retaking the field. 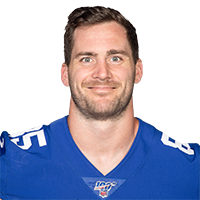 Scott Simonson will serve as the top backup to starting tight end Evan Engram as long as Ellison remains sidelined. Ellison failed to haul in his lone target in Sunday's loss to the Titans. Analysis: It marks the second week in a row that Ellison has gone without a reception, as his offensive reps continue to drop. Evan Engram has been heavily involved in the offense since returning from a hamstring injury, leaving little room for Ellison in the game plan. Ellison (ankle) was a limited participant in Thursday's practice. Analysis: Per Dan Duggan of The Athletic, Ellison, who sat out Wednesday's practice, took part in individual drills in his return to work and looked to be running at full speed during the media-access portion of the session. Ellison would clear up most of the concern about the health of his sprained ankle by practicing again Friday in any capacity. Ellison (ankle) isn't expected to practice Wednesday, Jordan Raanan of ESPN.com reports. Ellison injured his ankle during Sunday's 40-16 win over Washington, Jordan Raanan of ESPN.com reports. Analysis: Ellison has been surprisingly efficient with his opportunities in the passing game, but they're few and far between when Evan Engram is available, as was the case during Sunday's easy victory. Scott Simonson will fill Ellison's blocking role if the 30-year-old isn't available for Week 15 against Tennessee. Ellison is expected to return to a reserve role at tight end Sunday against the Redskins with Evan Engram (hamstring) cleared to play after missing the previous two contests, Jordan Raanan of ESPN.com reports. Analysis: While Engram was out, Ellison played 92.5 percent of the Giants' offensive snaps, parlaying the spike in usage into eight receptions for 119 yards across 12 targets. Ellison's snap count will dip with Engram back in the fold, though Raanan notes that the latter will be deployed primarily in obvious passing scenarios. That will allow Ellison, a superior to blocker, to retain a healthy amount of playing time, but his fantasy viability will take a hit nonetheless. Ellison caught four of seven targets for 42 yards in Sunday's 30-27 overtime win over the Bears. Analysis: With Evan Engram (hamstring) out for another contest, Ellison filled a three-down role (94 percent snap share) for the fifth time this season. The 30-year-old has averaged 3.2 catches for 40.8 yards on 4.8 targets in the five games Engram has either missed or barely played in this season, albeit with just one touchdown to show for the increased workload. The Giants do hope to get Engram back in the lineup for Week 14 at Washington, but there's no guarantee it actually happens. Ellison is expected to start and handle the bulk of the snaps at tight end Sunday against the Bears with the Giants ruling Evan Engram (hamstring) out for the contest, Art Stapleton of The Bergen Record reports. Ellison caught four of six targets for 77 yards during Sunday's 25-22 loss to the Eagles. Analysis: Ellison hadn't recorded more than three catches or 39 receiving yards in any game this season, but he was thrust into a larger role after Evan Engram hurt his hamstring in warmups, according to Art Stapleton of The Bergen Record. He responded with several sizable gains en route to a new career high in receiving yardage. It's unclear at this point if Engram will be sidelined next Sunday against the Bears, but Ellison could play a large role once again if he is. Ellison caught his lone target for 12 yards during Sunday's 38-35 win over Tampa Bay. Analysis: From a points perspective, Sunday was the Giants' best game of the season. Still, Ellison failed to reach 20 yards for the fifth consecutive game. The veteran target should not be looked at for anything more than an underneath catch or two per game, even Sunday against a struggling Eagles pass defense. Ellison caught his lone target during Monday's 27-23 win over the 49ers, gaining six yards. Analysis: The performance was a good one for the Giants, who tied the team's second-highest point total of the season. What was good for the team wasn't necessarily good for Ellison, who was held under 20 yards for the fourth consecutive week. He's not involved enough in what has been a pretty feeble passing attack to garner much attention, even Sunday against Tampa Bay's bottom-five pass defense, giving up 292 yards per game. Ellison failed to bring in his only target during Sunday's 20-13 loss to the Redskins. Analysis: Ellison remains the clear No. 2 tight end behind Evan Engram, but served as a blocker on the vast majority of his offensive snaps. As long as Engram remains healthy, it does not appear that Ellison will receive enough offensive looks to warrant fantasy consideration. Ellison caught both of his targets for 11 yards during Monday's 23-20 loss to the Falcons. Analysis: Even though he's taking a clear backseat to a healthy Evan Engram, Ellison still logged exactly half of the available offensive snaps and should continue to retain some sort of role in the offense given his strengths as a blocker. However, with Engram being the far superior receiver, Ellison will likely go overlooked in the passing game more often than not, and Monday's performance was an example of exactly that. Ellison (foot) practiced in full Thursday. Analysis: With Evan Engram holding the same status after missing three games due to a sprained MCL, the Giants' tight end group is intact for the first time since Week 3. Ellison was targeted just three times when Engram played the entirety of the team's first two games of the season, a level that the former is expected to fall back to after sitting out Week 6 himself with a foot injury. Ellison (foot) is inactive for Thursday's game against the Eagles. Ellison (foot) is listed as questionable for Thursday's contest against the Eagles. Ellison (foot) was a limited participant during Tuesday's practice. Ellison was listed as a non-participant on Monday's injury report with what coach Pat Shurmur called a sore foot. Analysis: Ellison has filled in for Evan Engram (sprained MCL) during his two-game absence, logging at least 54 offensive snaps the past three contests. The increased usage seemingly has had a residual effect. With Ellison's Week 6 availability in question and Engram potentially returning to action Thursday versus the Eagles, Ellison could soon be reliant upon scraps, depending on if his health allows him to suit up. Ellison caught two of his three targets for 17 yards in Sunday's game against the Panthers. 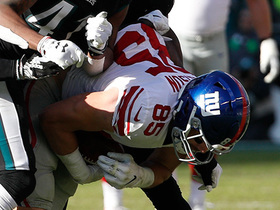 Analysis: Ellison started at tight end again with Evan Engram (knee) still out, but he is still not a primary target of quarterback Eli Manning. He's now caught just five passes for a total of 46 yards over the last two weeks, and, for now, can be safely avoided for fantasy purposes. 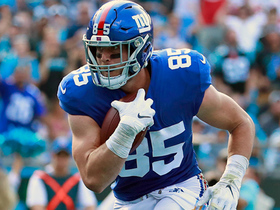 Ellison is expected to serve as the Giants' primary tight end Sunday against the Panthers with Evan Engram (knee) ruled out for the contest. Ellison caught three of five targets for 29 yards against the Saints on Sunday. Analysis: With Evan Engram out, Ellison should have a bigger role in the passing game, but he's a distant fourth option behind Odell Beckham, Sterling Shepard and Saquon Barkley. Ellison will take on a larger role while Evan Engram recovers from an MCL sprain, Art Stapleton of The Bergen Record reports. Analysis: With Engram likely facing a multi-game absence, Ellison may find himself in an every-down role the next few weeks. The veteran blocking specialist displayed some unexpected versatility in Sunday's 27-22 win over the Texans, catching each of his three targets for 39 yards and a touchdown while playing 87 percent of the snaps on offense. Sterling Shepard is another candidate to draw more targets while Engram is sidelined. Ellison hauled in both of his targets for five yards during Sunday's 20-13 loss to Dallas. Analysis: Ellison's involvement in the passing game comes as a bit of surprise, regardless of how sparse it was. With Evan Engram in front of him on the depth chart and the likes of Odell Beckham and Saquon Barkey in the offensive mix, Ellison remains a fantasy afterthought. Ellison was diagnosed with migraines, Art Stapleton of The Bergen Record reports. Analysis: The doctors first believed Ellison suffered an eye injury due to his blurred vision. 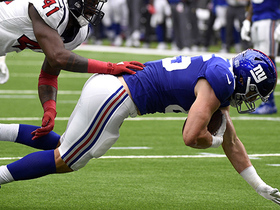 Migraines can come in unpredictable waves, so it's definitely a diagnosis the Giants will watch closely, especially with starting TE Evan Engram already in the league's concussion protocol. Ellison said he's fine after suffering an eye injury during Friday's preseason game against the Jets, Dan Duggan of The Athletic New York reports. Analysis: Ellison also said he would've returned if it was the regular season, but he'll still visit the doctor Saturday to be sure. It's good news for the Giants, as Evan Engram left the game as well and entered concussion protocol. If Engram can't get healthy by the time Week 1 kicks off, expect Ellison to see a hefty workload right off the bat. Ellison is questionable to return to Friday's game against the Jets after suffering an eye injury, Paul Schwartz of the New York Post reports. Analysis: Ellison's exit comes on the heels of starting tight end Evan Engram suffering a concussion, leaving Jerell Adams as the top option at tight end for the time being. It wouldn't be surprising for the team to leave Ellison out merely for precautionary reasons at this point. 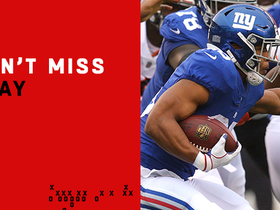 Ellison led the Giants in receiving Sunday with five catches for 63 yards on six targets. Analysis: Ellison filled in for the injured Evan Engram, but should go back to his role as blocking tight end in 2018. Ellison likely will replace Evan Engram (ribs) as the starting tight end for Sunday's season finale against the Redskins, Jordan Raanan of ESPN.com reports. 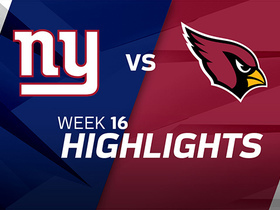 Analysis: Engram's usual snaps were divided between Ellison and Jerell Adams after the rookie tight end was forced out of last week's 23-0 loss to the Cardinals. Ellison took advantage with four catches for 60 yards on seven targets, but his track record as a blocking specialist suggests he's unlikely to provide similar production Sunday. Adams is the better bet to get playing time on obvious passing downs. Ellison (finger) won't carry an injury designation into Sunday's game against the Eagles. Analysis: Ellison was a limited participant in practice all week, but the injury apparently isn't too serious since he avoided being listed as questionable. 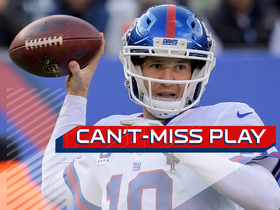 The 29-year-old will again serve as the Giants' No. 2 tight end behind Evan Engram versus the Eagles. Ellison was listed as a limited participant at Thursday's practice due to a finger injury. 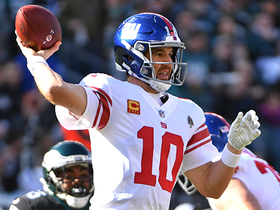 Analysis: Ellison has been limited in both of the Giants' practices to begin the week, though it's not believed that his status for Sunday's game against the Eagles is in any major jeopardy. While Ellison makes his greatest impact for the Giants as a blocker, he was surprisingly involved in the passing game during the Week 14 loss to the Cowboys, catching four of five targets for 20 yards and his second touchdown of the season. New York Giants running back Saquon Barkley's high-effort run sets up kicker Aldrick Rosas' 57-yard field goal before halftime. New York Giants quarterback Eli Manning connects with tight end Rhett Ellison in stride for 29 yards. New York Giants tight end Rhett Ellison makes an 18-yard catch amid three Philadelphia Eagles. 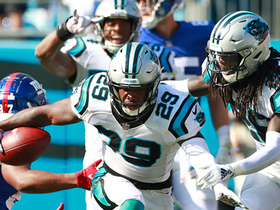 Carolina Panthers safety Mike Adams comes up with an interception on New York Giants quarterback Eli Manning after a long Giants drive. Rhett Ellison narrows the gap for the New York Giants with a two-point conversion catch vs. the Carolina Panthers. New York Giants quarterback Eli Manning dials a long distance pass to tight end Rhett Ellison for 27 yards. 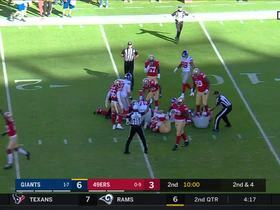 San Francisco 49ers safety Eric Reid recovers New York Giants QB Eli Manning fumble.